In 1972, the Shah of Iran, serving as a major shareholder in Mercedes-Benz at the time, decreed to the board that a purpose built cross-country military vehicle be conceived in the form of the Gelandewagen. 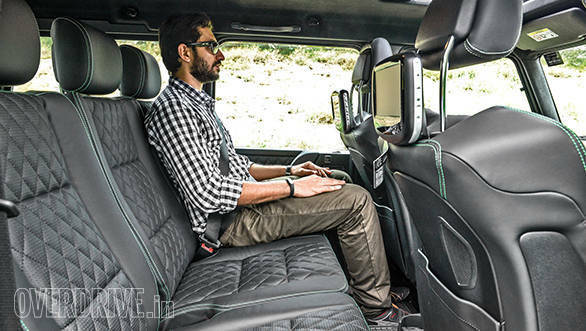 Seven years later, civilians were given an opportunity to taste the go-anywhere capabilities with the G-Class  a commercially available version of the G-Wagen. 43 years later, the function-over-form design mandate of the G-Class finds itself out of place in this age of luxurious elegant SUVs. So in 2006, Mercedes-Benz considered replacing its oldest production class of passenger vehicle with the more relevant unibody GL-Class. That of course, never happened. Such was the reverence for the G-Class that Mercedes-Benz was forced to extend its production up to 2020. 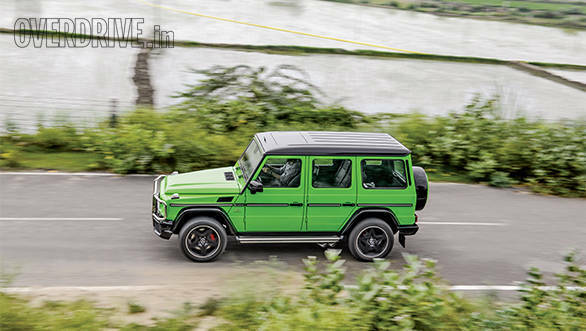 In fact, even in a brand conscious country like India, the G-Class' resemblance to people-movers like the Force Trax, Mahindra Bolero and Tata Sumo didn't stop it from becoming one of the highest selling cars in the well-heeled AMG portfolio. 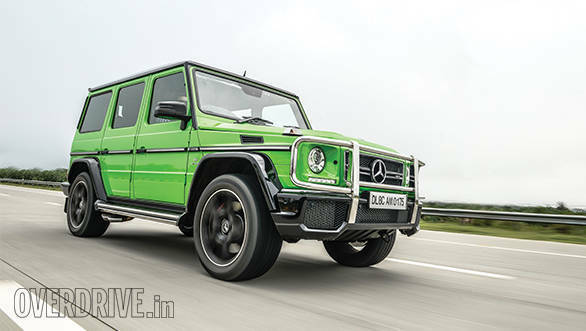 And if the concept of spending over `2 crore on something that an average pedestrian couldn't differentiate from a sub-`10 lakh SUV wasn't outrageous enough, Mercedes-Benz have now launched the Crazy Colour Edition of the G-Class in India. The crazy part isn't pumping over 500 horsepower into something with the drag coefficient of a bread box  it's the outlandish colours  Tomato Red, Sunset Beam Orange, Solar Beam Yellow, Alien Green and Galactic Beam Purple. Well, that's one way of standing out. 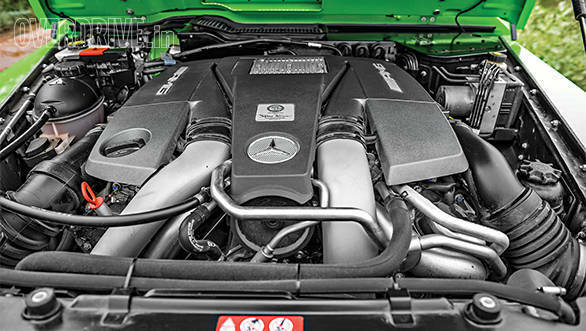 The G-Class is offered in India in the form of the twin-turbo G 63 AMG, which replaced the supercharged G 55 AMG. The design language (if I can call it that) remains the same  utilitarian on the outside, and brimming with luxury on the inside. 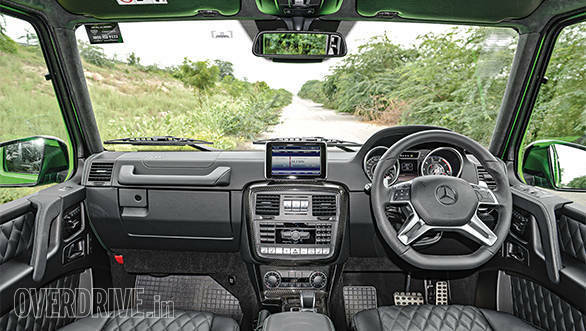 This transformation comes in the form of exceptional materials, Mercedes' flagship Comand infotainment system with a 7-inch TFT screen, the Harman Kardon Logic-7 music system with 12 speakers, a 10 channel amplifier and a 450 Watt Dolby Digital surround system, and DVD players and screens for the rear passengers as well. The Crazy Colour Edition gets a few optional extras as standard  colour coordinated stitches (46,000 of them) on the upholstery, Designo leather pack, AMG steering wheel, carbon-fibre bits and five-spoke alloys  everything to the satisfaction of Herr Deutschmann whose nod of approval continues to be the final diktat at the Graz manufacturing facility. The G-Class is a typical vehicle built from a left-hand drive architecture, something you can tell by the hand-brakes and engine hood lever on the left. The space on the back seat is nothing like you'd expect gauging the size of this vehicle from the outside. At 259mm, the kneeroom is relatively appalling for a vehicle this expensive. Thankfully, due to the tall and wide stance, there's plenty of head and shoulder room. The body rests on rubber mountings so there's less vibration in the cabin and Mercedes have done a good job of insulating the noise  something I'm a little pissed off about. Sure it drowns out all the unwanted cacophony from the outside world, but it also takes away the divine bellow of the AMG performance exhausts. Just roll down the windows, you'll see what I mean. 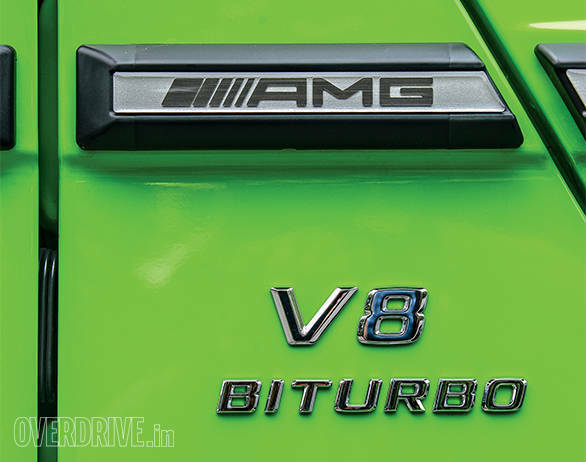 The G-Class features a V6 (G 350) and a massive V12 (G 65 AMG) globally, although India gets the G 63 AMG which houses a 5.5-litre, twin-turbo, V8 petrol burner that makes 34PS more power and 60Nm more torque than the supercharged G 55 AMG. Make no mistake  the G 63 is an 'off-roader' with supercar-like performance on the road. Consider this  the 2,550kg mammoth can hit a 100kmph in a claimed 5.9 seconds  no thanks to the non-existent aerodynamics. And that feels scary. The steering set-up is an interesting one. There are no gaiters or rubber bellows. It, in fact, uses a traditional recirculating ball mechanism which is ideal for off-roading as the shocks from the terrain don't get transferred to your wrists. However, at the crazy speeds the G 63 is capable of, it did get me a bit nervous. The other thing that made me nervous about the G 55 AMG when I drove it to Ladakh was the 5-speed automatic gearbox which did not let you control gear changes at all. Thankfully, the G 63 AMG gets the 7G-AMG SpeedShift Plus automatic gearbox with paddle shifters. This transforms the driving experience of the G considerably. The gearbox also lets you choose between Comfort, Sport and Manual modes, depending on how you want to drive it. And if you want to be economical and eco-friendly with the G 63, you can, because it features a start-stop system as well. No, not really. 7.24 kilometres per litre of fuel and 322 grams of CO2 emitted per kilometre is not fuel efficient or eco-friendly by any standard. But who cares! If you do, buy yourself an i8. Despite the conventional rigid axles, the ride quality of the G-Class is adequately plush, notwithstanding the body roll and pitching under braking, and the slightly stiff suspension set-up. Of course, not many owners of the G 63 AMG, as with the G 55 AMG before it, are likely to take the G-Class off the tarmac, and that's unfortunate considering its raison d'être and the fact that the G-Class was born in the toughest terrains on the planet  the breeding grounds of Stockl, south of the Alps. Its construction is as old-school as it gets  a ladder-frame chassis with rigid axles with the body bolted to the frame at eight points. The ladder-frame's torsional strength protects the body from the longitudinal forces caused by the heavy duty axles and the underbelly from the terrain. The geometry of the design is dictated by its need to conquer ludicrous surface angles, so you have the angle of approach and departure at 27 degrees, the breakover angle at 24 degrees and a ground clearance of 220mm that affords it a wading depth of 600mm. It's one man's opinion but you can't call an SUV a true-blue off-roader unless it has all-wheel drive with low ratios, a transfer case and differential locks. The G 63 has permanent all-wheel drive with low ratios which you can select on the fly under speeds of 40kmph (only engages in neutral gear). 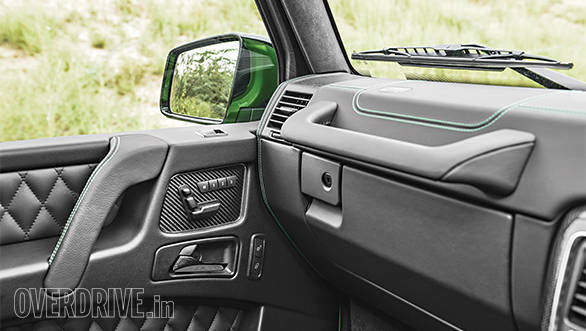 It also has differential locks  plural, not two, but three  one for each axle and one for the drive shaft. Each of them can be locked individually as per the requirement. While electronic aids such as Electronic Stability Program (ESP), four-wheel Electronic Traction System (4ETS) and Anti Slip Regulation (ASR) actively keep the G 63 AMG safe in most situations, passive safety is ensured with the help of six airbags and neck-pro head restraints. The already brilliant AMG adaptive brakes are aided with ABS and Brake Assist, and you also get this convenience on inclines thanks to the Hold function. The G-Class is no longer the no-frills, utilitarian vehicle it was born as. The G-Class occupies a unique headspace  many before me have called it inverted snobbery. The fact that its purpose-built design camouflages its manic performance and the inviting comforts of its cabin is kind of cool. There is madness in its very existence, which has now been exacerbated by the audacious colours. And then there is that crazy price you pay for it.